Fox News: CNN is reeling in that fake news mess of a retracted Russian collusion story that we’ve been talking about all week. PragerU.com: Only 7% of American journalists identify as Republican. And while a lot of news outlets forbid their reporters to donate to candidates, 96% of those who did donate last time out, gave to Hillary Clinton. These journalists claim that despite the fact they’re all Democrats, they can be objective. It just ain’t so. Right now, you can obtain pre-1965 90% silver coins at very close to their melt value. Since these are historic, no-longer-minted products, premiums can rise due to scarcity. That will likely happen at some point in the future. Jim Rickards: Sure. We have a war on cash. I think that’s pretty well known to the listeners, so we see it everywhere. India just abolished its two most popular forms of cash. They literally woke up one day and they said, I think it was the 2,000 rupee note and the 1,000 rupee note, if I’m not mistaken. I believe those are the right denominations. Not worth a whole lot by our standards, worth like $15 or whatever. But they were, by far the most popular and widely used, widely circulated bank notes in India. And the government just woke up and said they’re all illegal. They’re worthless. Just like that. Now what they said is, “Now you can take them down to the bank and you can hand them in, and we’ll give you digital credit in your account—oh by the way, the tax inspector’s going to be there asking you where you got the money.” So obviously it was designed to flush out people suspected of tax evasion. Although, in fact it turned out that there weren’t that many tax cheaters. They were just people who actually preferred money. The preferred cash and they were forced out of the system, forced into this digital system. And there were all kinds of negative repercussions of that. So, there’s a whole country that abolished the most popular forms of cash. Sweden is very close to cashless. You go around the United States, you might have some, what we call in Philadelphia “walking around money.” I can look in my wallet and there’s probably some 20s and maybe a couple 50s in there, but when you transact, you get paid digitally. You pay your bills with automatic debits. You transfer money with wire transfers. You use your debit card. You use your credit card, etc. You shop on Amazon, you pay with a debit or credit card, etc. maybe PayPal. And I do that. Everyone does that. I’m no different. I’m not exempt from or outside the system. The point is the dollar is already a digital currency. It’s actually a digital crypto-currency, not that different from Bitcoin. It has a different issuer, but in form it’s really a digital currency. But we’re very far down the road of a cashless society. It wasn’t that long ago, certainly when I was a kid, we had $500 bills. And they were in circulation. You’d see one every now and then. Those were abolished in 1968. That left us with the $100 bill as our largest denomination. But the $100 bill of 1968 is only worth about $20 today in terms of relative purchasing power. So, they don’t even have to get rid of the 100, they just have to keep waiting and it’ll be worth about 10 cents in time. So, the war on cash is underway. That’s partly to set up for negative interest rates. I said earlier that the Fed has not used negative interest rates and has no immediate plans to. That’s true, but they can. There’s nothing stopping them. And of course, other countries have. We’ve seen this in Europe, Switzerland, Japan, and elsewhere. So how does the negative interest rate work? So, you have 100,000 in the bank and the negative interest rate of one percent. You go away for a year, come back, you only have 99,000 left. The bank took $1,000 out of your account instead of paying you interest, they take your money as negative interest rate. Well you say, “Okay, well one of the ways to beat negative interest rate is to take all my cash out… stick it under my mattress or whatever, right?” So you go to the banks, they give you $100,000. They give you ten, what they call straps or $10,000, a 100 100s with a band around it. That’s one strap. So, they give you 10 of those and there’s your $100,000. And you put it away safely, and a year later, you still have 100,000. But your neighbor with the money in the bank, he only has 99 (thousand), because they took 1% interest. So, the way to beat negative interest rates is to go to cash. By the way, this is already going on in what I call the axis of gold. The axis of gold is Russia, China, Iran, Turkey and North Korea. When North Korea sells missile technology to Iran, they don’t get paid in dollars through Swift. That would never happen. That money would be frozen obviously. The North Koreans really don’t want Russian rubles, what are they going to do with them? They can’t get dollars, because of the state of the U.S. controls the payment system. So, Iran actually pays them with Korean gold, physical gold. Puts it on a plane, they can fly it to North Korea, or maybe North Korea designates someplace else like Russia as a storage place, because they don’t want it in their own backyard. But be that as it may. As I say, Russia, China, Iran, Turkey and North Korea and perhaps others are already settling their payments to each other either for weapon sales or other activities in physical gold. So, if you have a war on cash people very quickly migrate to gold, which means you have to have a war on gold also. So, one of the reasons I’ve been predicting a war on gold is because I see the war on cash is already here. And if the answer to the war on cash is to go to gold, then if you’re the global power elite, you have to have a war on gold also. So, a lot of these things don’t exist today, but it’s very easy to see limitations on sales, certainly from 1933 to 1975, gold was contraband in the United States. It was illegal for a U.S. citizen to possess gold. With very few exemptions. You could have gold denture fillings, I guess or some gold jewelry, but not coins or bullion. So, you could limit sales, you could put all kinds of reporting requirements on dealers, which don’t exist today. You could put surtaxes on dealer transactions, which don’t exist today, etc. or require licensing, which does not exist today. 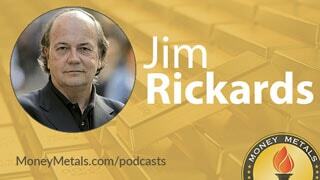 Jim Rickards: Well I don’t think there’s much that will happen that you can’t perceive today. Now there are always surprises. I understand that there’ll be terrorist attacks we haven’t anticipated, etc. but a lot of the big things that are going to happen in 2018, you can always see them coming, because this is the kind of analysis I do. It’s complex dynamic systems analysis. In other words, rather than using stochastic equilibrium models, which is what the Fed does or other obsolete models that are linear in nature, I use a complex theory in complex dynamic systems modeling, because I like to say the future’s already here today. It just hasn’t played out yet. In other words, if you understand how a system evolves and you understand something about the initial conditions, you can make some forecasts. So, for example, one model would be the Mundell-Fleming model, which is sometimes called the impossible trinity. It’s one of the leading models of international monetary economics. And basically, it says there are three things that you cannot have at the same time if you’re a country. You cannot have an open capital account, a fixed exchange rate and an independent monetary policy. you can have two out of three, one out of three, but you can’t have all three. If you try, you will fail. And then the only analytic question is how will you fail and when? But it’s called the impossible trinity for a reason, which is you can’t have it. Now, and the reason is that has to do with arbitrage. If money can come in and out, and I’m pursuing independent monetary policies, my rates are different than somebody else. But I’m trying to peg my exchange rate. Well, obviously, people are going to flee the jurisdiction where they think the interest rate is going to devalue and go to another currency where the interest rate is higher and the currency is going to appreciate not depreciate. And that’s going to deplete your capital account and cause a foreign exchange crisis. I don’t mean to be glib about the impossible trinity. There are actually good reasons when you look below the surface why it’s true. But just take it for true, but now and again, there’s decades of evidence to support it. China was trying to do this. They were trying the impossible trinity. If you go back to the middle of 2016, even towards the end of 2016, they were running an open capital account to keep the IMF happy. They were trying to peg to the dollar to keep the United States happy. And they were trying to have an independent monetary policy of low interest rates to prop up their Ponzis and their state-owned enterprises and avoid unemployment. So, they had three good reasons for doing three separate things. But they were trying to have the impossible trinity and as they say in Mundell-Fleming model would say, “You’re going to fail.” And they did fail. They started to fail, which is between late 2014 and late 2016, China lost one trillion dollars in reserves. That was exactly what Mundell would have predicted. The money will run out the door, because they think your fixed exchange rate is not sustainable, because your interest rate policy is too low, etc. They lost a trillion dollars. If you had extrapolated that. It’s never a very good idea to extrapolate anything. But just as a thought experiment, if you had extrapolated that and further assuming that it accelerates, which historically, they do. China would have been broke by the end of 2017. Now what I said was, that’s not going to happen. They’re not going to let that happen. So, the question is, what are they going to do about it? Well, you had three choices. You could close the capital account, break the peg to the dollar, or raise interest rates. They decided to maintain the peg. They did the other two. They closed the capital account, pretty effectively for the time being. And they raised interest rates in lock step with the Fed. So, they gave up on two of the three legs, kept the third, which is the peg to the dollar. The yuan has been pretty constant against the dollar lately, which was done to, as we get into late 2016, early 2017 to appease Donald Trump, because remember Donald Trump was the one running around on the campaign trail saying, “China’s the greatest currency manipulator of all time.” While the last thing the Chinese needed was the devaluation. That would have played into Trump’s hands, allowed them to slap on all kinds of trade sanctions and other punitive measures as a result of being labeled a currency manipulator, etc. Trump didn’t do any of that for two reasons. One, China had maintained the peg, did not devalue further, they actually spent money to prop up the yuan. And two, Trump wanted China’s help on North Korea, so he was willing to play nice in the economic sphere to get help in the geopolitical sphere. Now, both of those things are coming to an end, because they’re not sustainable. And specifically, if you close your capital account – and they have done a pretty good job of that – they stopped the bleeding. But that has an effect on direct foreign investment and portfolio investment in China. Who wants to put their money in if you can’t get your money out? The answer is nobody. So, their investment inflows are drying up. That’s the other side of closing the capital account. Number two, this monetary tightening is creating a more difficult situation for the state-owned enterprises and other debtors, and China’s just one big credit bubble, one big Ponzi waiting to burst. And three, it’s now become apparent, literally a couple days ago, Trump sent out a tweet saying, “Looks like China can’t help with North Korea, but at least they tried.” Words to that effect. It’s not the exact quote, but it’s close enough. In other words, Trump is signaling that he believes China has failed or will fail to help with North Korea. And I think that’s right. There isn’t really a lot China can do about North Korea without risking war. China can do a lot with North Korea if they risk war. But they don’t want to risk war and therefore, they won’t do much. Therefore, Trump won’t be satisfied and then he’ll turn back to the currency war and other punitive measures that we talked about earlier. Now why is China doing all this? They’re doing this to keep a lid on the situation, to avoid confrontation, avoid crises until President Xi gets, in effect, anointed or reconfirmed for a second term with certain conditions that make him the new Mao Tse-tung this fall. But once that happens, once he gets that power that he’s looking for, and once it’s apparent that Trump’s going to play hard ball on the trade and currency issues, because China can’t help with North Korea. He will have no further reason to maintain the peg. So, what I expect then is, they will go back to an open capital account. They will cut interest rates. But they’ll reconcile the impossible trinity with a maxi devaluation of the Chinese yuan. The last two times that happened, the New York Stock market crashed. That was August 2015 and January 2016. So, look out below. It’s going to be interesting times. And then I also expect a war with North Korea in 2018. You can see that playing out now. The war is coming. We’ve been warned by General Mathers. President Trump took the whole Senate up to the White House, basically told them this was going to happen. Orders have already been given. We’re going to give diplomacy a chance and sanctions a chance in 2017, but my estimate is that they will not be fruitful and we’ll go to war in 2018. So, 2018 is set to be a tumultuous year because of the Chinese shock devaluation and a war with North Korea. Mike Gleason: Well, Jim, once again, it’s been a real pleasure to speak with you, and we certainly appreciate the time. Now before we go, please tell listeners about your latest book, The Road to Ruin as well as anything else you’re working on these days or want folks to know about. And then also how they can follow your work more regularly. Jim Rickards:Thank you very much, Mike. As you mentioned at the beginning, I’m the editor of Strategic Intelligence, that’s a newsletter from Agora Financial and a couple other newsletters with them. But Strategic Intelligence is our flagship newsletter. My latest book, The Road to Ruin from Penguin Random House, available on Amazon and leading bookstores. That covers a lot of the ground that we’ve covered in this interview. And I’m very active on Twitter. My Twitter handle is @JamesGRickards. It’s about 10% Phillies baseball and random things, but 90% of it is the international monetary systems. So, I hope followers find that helpful. I’m also on another platform called Collide. Just Collide.com. It’s a new platform, but I do weekly commentaries there. Mike Gleason: Well excellent stuff. We’re grateful as always to have you on and for your time and your incredible insights. We certainly look forward to our next conversation, and I hope you enjoy your weekend and your summer. Thanks very much. Appreciate the time, Jim. Mike Gleason: Well, that’ll do it for this week. Thanks again to Jim Rickards, author of Currency Wars, The Death of Money, The New Case for Gold, and now The Road to Ruin, and also editor of the Jim Rickards’ Strategic Intelligence newsletter, be sure to check those out.